Also known as 'Bokhara Burnes' from his travels to what was then a hopelessly remote location in the 1830s. He wrote a book Travels into Bokhara; being the account of a journey from India to Cabool, Tartary, and Persia which became a best seller and propelled him to being an expert on the Great Game and the North-West Frontier. At the end of 1836 Lord Auckland dispatched Burnes on a commercial mission to Kabul. Inevitably, however, political concerns about Afghanistan's position as a buffer between the British and Russian empires dominated the mission. 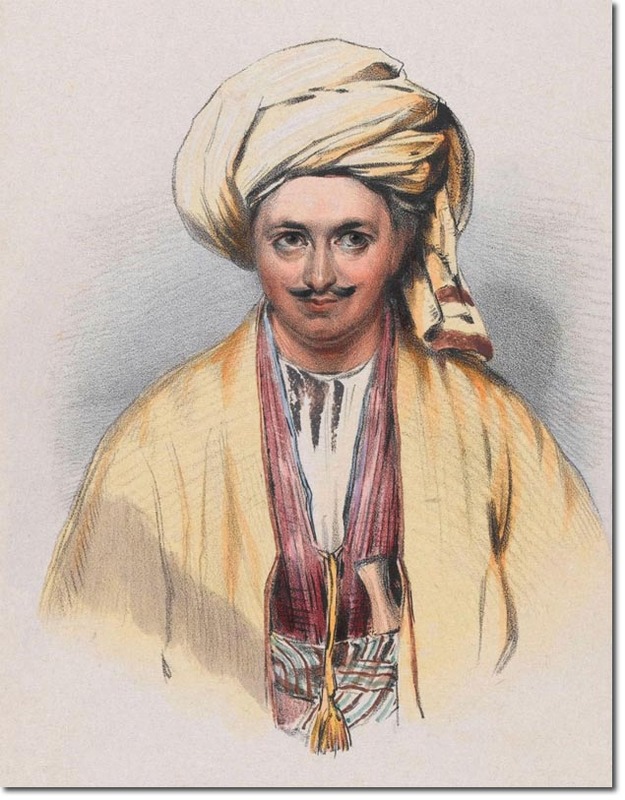 Burnes reached Kabul in September 1837 and was warmly welcomed by the amir, Dost Muhammad Khan, who was desperately seeking an ally to help fend off Sikh and Persian aggression. Burnes, who had formed a favourable impression of him when they had met in 1832, wanted to offer him British support, but he was over-ruled. Lord Auckland and his counsellors mistrusted Dost Muhammad's independence and proposed instead to restore a former amir, Shah Shuja, to the Afghanistan throne and hence have their own man in Kabul. Burnes swung into line behind this policy although he had little faith in it; he had met Shah Shuja in exile in 1831 and thought him an ineffectual leader. In the summer of 1838 Burnes was sent ahead of the army of the Indus to smooth its passage through Sind and Baluchistan en route to Afghanistan. In August 1839 he was one of the three British officers who escorted Shah Shuja into Kabul but, to his disappointment, the top job of envoy went to William Hay Macnaghten, one of the architects of Shah Shuja's restoration. In 1838 Burnes learned that he had been knighted and granted the brevet rank of lieutenant-colonel, but this was inadequate compensation for the boredom and inactivity he endured as the second political officer in Kabul. Towards the end of 1841 the political situation deteriorated and Burnes, although aware of the unpopularity of Shah Shuja's government, was unprepared for the ferocity of the Afghan revenge. On 2 November 1841 an infuriated crowd besieged his house in Kabul and murdered him, along with his younger brother Charles and Lieutenant William Broadfoot. It marked the beginning of Britain's disastrous retreat from Afghanistan. Ironically, in the ensuing search for scapegoats it was Burnes's reputation which suffered most, even though he had been a severe and well-informed critic of the policy of intervention. Cabool: being a personal narrative of a journey to, and residence in that city in the years 1836-38 was published posthumously in 1842.